Patch 1.0.3 means that new players may have to wait 72 hours to access the full game. In a move made ostensibly to combat credit card fraud, Blizzard has announced that one of the updates included in Diablo III's latest patch is a mechanism that restricts initial access to new copies of the game which have been bought online. In practice, this means that any newly-bought digital Full Edition copies will be restricted to Starter Edition content for up to the first 72 hours of ownership. - Global Play is not available. 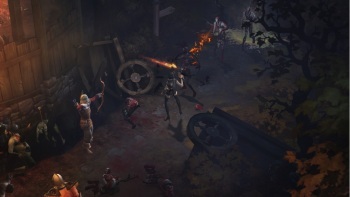 Players attempting to connect to Diablo III Starter Edition in a region other than their Battle.net Account's home region will receive Error 12. See the Global Play support article for more information. Another support agent explained the situation by saying that, "[Blizzard] apologize for the inconvenience, but it is a necessary step to combat fraud and other malicious activities that can weaken everyone's play experience...The delay is no longer than three days, and is often much quicker than that. Hang tight. :)." Blizzard has yet to comment on any possible relation this update has to reported post-patch 1.0.3 situations where some players found themselves unable to gain XP or level their followers beyond Level 13. Only digital copies of the game were affected. Is making potential new customers pay the price for cheats, thieves and other such undesirables really the way Blizzard should be handling this? (I'm going to go out on a limb here and guess that most of you would answer that with the word "no" or a colorful variant thereof.) Maybe the company will release a report in a few months detailing how restricting access to something a gamer bought fair and square has helped reduce credit card fraud and cheatery to such an extent that the scheme is worth it, or something? Maybe?